The situation with the tens of thousands of illegal immigrants, who invaded the shores of the island of Lesvos this summer, is getting totally out of control. Over the last few days the Greek riot police and Port authorities have been attempting to bring some order to the chaos that has been created there, but to no avail. Even tear gas and stun grenades were used to calm the angry crowds and yet the situation is still out of control. And if that isn't enough, over the last few hours, a series of photographs have been circulating on the Internet with a threatening message from the illegal immigrants themselves. 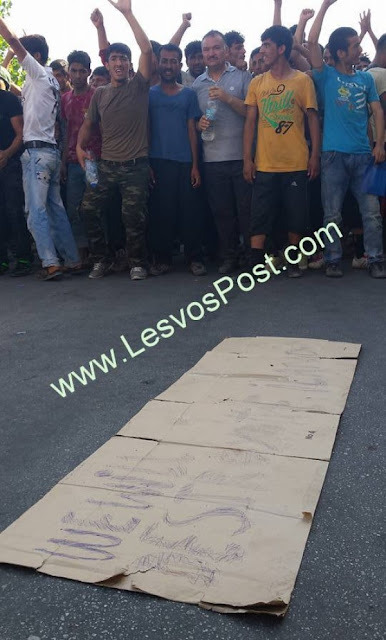 Written on the placard are the words "WE WILL DESTROY THE ISLAND" and as seen in the photo by the Lesvospost, and as reported by the military defence site defencenet, there are several immigrants posing in front of it. It is unknown if this is a provocation, or was indeed written by a few immigrants themselves, the only thing that is certain is that something needs to be done because the residents of the island are now outnumbered. We say this because as seen in the video above, many illegal immigrants apparently broke into and apparently looted a butcher shop and are now armed with Hajar, knives and cleavers. (Check video ABOVE at 1'49 seconds and what is stated to the Minister of Immigration by the Island's Authorities). No one knows how this situation will unfold, but one thing is certain, something needs to get done and it needs to be done NOW! The riots and attacks on Greek authorities is now a daily occurrence, especially when the ferry boats begin boarding passengers. On Sunday for instance, the main harbor on the island turned into a battlefield with Afghans -who refuse to be documented- trying to illegally board the ship which was transporting legal refugees from Syria to the port of Piraeus. The incidents began when they spotted the "Eleftherios Venizelos" ship in the dock. The rioters -who we repeat have illegally entered our country- began pelting Greek authorities with Molotov cocktails, so the Greek riot police and Coast guard responded with tear gas and stun grenades. The same scene was repeated when the "Terra Jet" ship arrived as well. A separate report from TO VIMA claims that even more clashes broke out later in the day at the Kara Tepe camp which was set up to temporarily house some of these people. 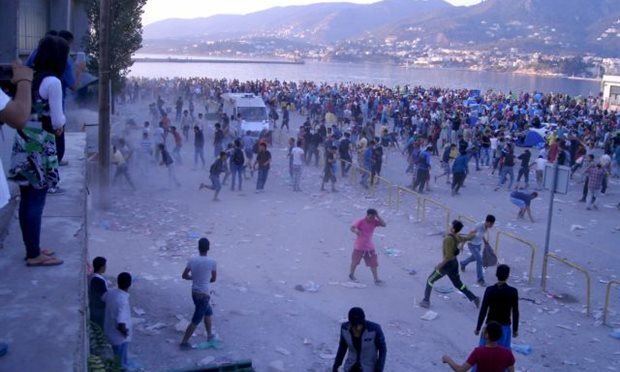 This clash began about half hour after the registration of Syrian refugees began. According to this report a separate group of illegal immigrants demanded that they be documented first before the Syrian refugees (who we all know are the only ones that are entitled to be given asylum, everyone else is an illegal intruder in our country). In the chaos that followed two Greek Coast Guard officers and three migrants were injured. The report in TO VIMA reveals that many more who where caught up in the scuffles, primarily women and children, experienced breathing problems from the commotion on the island’s port and were taken to the local hospital for first aid. The same report from TO VIMA notes that two youths – aged 17 and 19 – were arrested for throwing Molotov cocktails against Syrian refugees. At about 2am on Saturday they threw a Molotov cocktail against a family of Syrian refugees that was camping in a municipal garden, injuring a 30-year-old Syrian man. About 15 minutes later they three a second bomb against another family that was camping in a park, however they missed their target. Luckily a CCTV camera caught them red-handed and they were promptly arrested. The two have reportedly confessed and will be facing felony charges. It appears that the 17-year-old had constructed the Molotov cocktails. The situation has angered the residents on the island of Lesvos who are now feeling threatened with their presence. Indicative is the video below that was filmed by RTL. On Monday tens of hundreds of illegal immigrants protested on Lesvos asking their transfer to Greece’s capital Athens. They demand to be immediately transferred to Athens in order to be moved elsewhere within Europe. We need not remind our readers that they are demanding this without presenting any proper documentation. There is a very good reason why HellasFrappe keeps noting this. Migration Minister Yiannis Mouzalas told a reporter on STAR channel on Monday (VIDEO BELOW) that there is a possibility that jihadists are among the refugees who arrived in Greece. According to European security services it is possible a small number of jihadists crossed into Europe through Greece. He said that at least two-thirds of the estimated 15,000-18,000 refugees and economic migrants stranded in "miserable" conditions on the eastern Aegean island of Lesvos are going to be ferried to the mainland in the next five days. That leaves one third on the island, who again we repeat are refusing to be documented. He also announced that extra ferries were laid on Monday to transport these people to the mainland while some ships will serve as temporary screening and reception centers. At the Greek-FYROM boarder where many of these illegal immigrants are headed to, scuffles broke out early Monday between FYROM police and thousands of illegal immigrants attempting to head north toward Europe. According to the Associated Press, about 2,000 people had gathered at the Greek border near the village of Idomeni just after dawn, attempting to cross into FYROM, but authorities there were allowing only small groups to cross every half hour, leading to tension. The situation later calmed after more were allowed to cross, with about 1,000 having passed the border by mid-day. Police officials in Greece note that more than 5,000 people have crossed the border heading north in the 24 hours from Sunday morning to Monday morning. Imagine how many illegal immigrants are entering Greece on a daily basis. (All thanks to SYRIZA's open boarder policies).